Update: Judith continues to talk nonsense - see below. Until this exchange, it never occurred to me that the IPCC’s attribution statement was attempting to convey AGW attribution that was possibly outside the range of 0 to 100%. It is extremely likely that more than half of the observed increase in global average surface temperature from 1951 to 2010 was caused by the anthropogenic increase in greenhouse gas concentrations and other anthropogenic forcings together. The best estimate of the human induced contribution to warming is similar to the observed warming over this period. In other words, the best estimate is that we've caused all the warming. What happens is that deniers latch on to the first sentence in the paragraph and ignore the second. Given Judith's preference for denial, it looks as if she did the same. Fancy her not realising until now, after all these years working in climate science, that the science shows we've probably brought about more than 100% of global warming (mostly via CO2 emissions) plus some offsetting global cooling (via aerosols). Does anyone else find this really, really odd? Judith has got a really long article (archived here) which is mostly her wondering whether or not "more than half" and "more than 50%" mean much the same thing or not. And how much more than half predominately is. No. I'm not exaggerating. Look for yourself. Is that weird or what! Do you think she is mounting a defence of her denial by means of failing cognitive function? The IPCC report shows in various different places how the current warming is down to all the extra greenhouse gases we've added to the atmosphere. Here's one example from Box TS.5, Figure 1 of the IPCC AR5 WG1 report. The bottom curve in the top chart is the greenhouse forcing, which you can see has gone up hugely since industrialisation. The bottom chart is the northern hemisphere averaged surface temperature. Click to enlarge as always. I find Judith's article quite silly. What is more incomprehensible to me is her claim that she didn't realise till now that the IPCC indicated it quite likely that human activity is responsible for more than 100% of the warming in recent decades. She is a Professor and former Chair of the School of Earth and Atmospheric Sciences. How could she hold those posts and not learn this most fundamental finding? Look, I know that researchers tend to focus in on their own particular area of study. However I cannot believe that anyone whose work is related to climate science wouldn't at some point step back and learn the big picture stuff. One of the first things that anyone learns about climate is that humans are responsible for most of the warming, and probably more than all of the warming since 1950.
a) Warming since 1950 is predominantly (more than 50%) caused by humans. b) Warming since 1950 is predominantly caused by natural processes. This is not a good start. The statements that ended up in the IPCC SPMs are descriptions of what was found in the main chapters and in the papers they were assessing, not questions that were independently thought about and then answered. Thus while this dichotomy might represent Judith’s problem right now, it has nothing to do with what IPCC concluded. In addition, in framing this as a binary choice, it gives implicit (but invalid) support to the idea that each choice is equally likely. That this is invalid reasoning should be obvious by simply replacing 50% with any other value and noting that the half/half argument could be made independent of any data. Do you think that Judith is just pretending to be so ignorant about climate science or do you think she really and truly doesn't have a clue? Given her academic posts and the fact she's been blogging about climate science for years, I don't think the latter choice is possible. Which leads one to the unpalatable conclusion that she deliberately sets out to spread doubt, confusion and disinformation about climate. Update - about that "other piece"
ATTP and Tobis and Sou are ‘confused’, they think of course 110% is more than half. They think it is even funnier and stupider of me to respond but what if the other piece is 220%? If % are unconstrained between 0-100, you don’t know. I am thankful to Denizens who are able to see the problems with this. Twitter can be painful, but I would expect better from those with Ph.D.’s in science. Judith is referring to the fact that it's probable that human emissions of CO2 have accounted for more than all the warming between 1950 and now, and that this warming has been offset by aerosols. Thus 100% of the warming is comprised of CO2 warming less aerosol cooling. The "piece" is the greenhouse warming. The "other piece" is what has counteracted the greenhouse warming. Piece A: this is CO2 forcing - brought about by human activity (burning fossil fuel etc). It has caused possibly more than 100% of the warming, say 110%. Piece B: this is aerosol forcing. It causes cooling. It has counteracted the warming. Without it, the world would be warmer. As it is, the 100% of the warming was brought about by the combined effect of greenhouse warming and aerosol cooling. Piece B is also Judith's "other" piece, which she argues could offset 220% of the warming. Hypothesis - including Judith's "other piece"
The warming is 100%. All or even more than all of it is from human activities. Let's say more than all of the warming was from human activities. Piece B has negated 220% of the warming via, say, aerosols, though I cannot recall a nuclear war recently. This represents Judith's "other piece". Piece C - there must be another "other piece", as yet unidentified by Judith. Total warming is 100%. Piece A contributed 110%. Piece B reduced this by 220%. Therefore Piece C accounts for 210% of the warming. Piece A + Piece B + Piece C = 100% of the warming; or 110 - 220 + 210 = 100% of the warming. Now who is confused again? There was one person who was adamant that it was awful to say that more than all the warming might be anthropogenic, because .. well, they never quite articulated why very clearly, other than arguing that the relevant metric gets weird if the denominator is close to zero (i.e. warming is close to zero). PS: on my laptop and my phone, the comment form doesn't work at all: I set the "comment as" then type my message, then when I hit "publish" the message disappears but never actually sends it. Consistently now, rather than once in a while. Sorry about that numerobis. I did some more investigation a while back and added what I found to the "comment policy". It might or might not help. Something to do with third party cookies. If anyone else is having the same problem, do let me know. I might have to set up comments in the same way that rabett run is - with making everyone comment in a new window rather than under the article. I'd rather not do that but if it's a widespread problem it could be worth a shot. 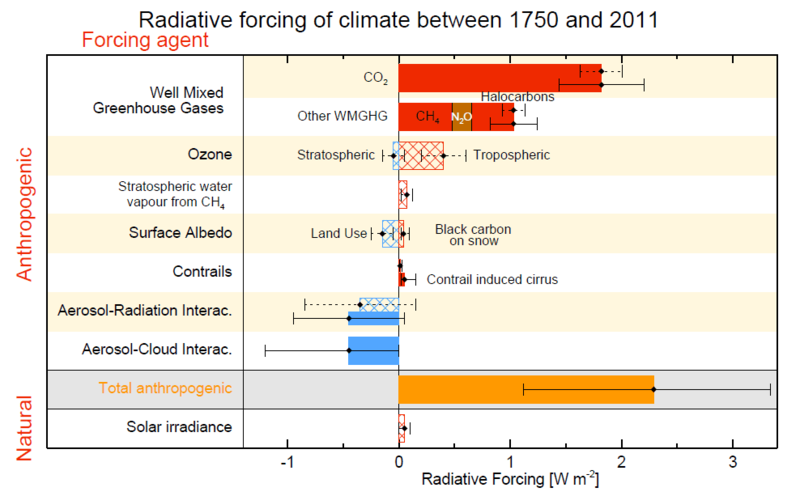 I find it really hard to believe that anyone who's looked at that radiative forcing chart - in all its current and previous incarnations/versions - and not ~seen~ that anthropogenic positive forcings exceed 100%. The damn things have been popping up in all sorts of places and even if you've never thought about it deeply, it must have dawned on you sometime in the last 5 or 6 years. The other thing that would reinforce that is all the reports (less of them lately) that there would be a big temperature increase if we managed to eliminate the great brown cloud from Asia. Because eliminating cooling by aerosols would unmask the full impact of other forcings. Once you've read and understood that, the _next_ time you see a radiative forcing summary it should be glaringly obvious. I can't tell Dr Curry what to do but If I were a scholar who spent many years in a senior post at a fine joint like GT, then at all times I would seek to protect my standing as a scientist. Dr Curry is making all manner of very poor choices (the type many of us make when we post comments after polishing off a bottle of Châteauneuf-du-Pape). Curry has disgracefully traded science for ugly politics. Going on 91, Fred Singer seems to be the model for Dr Curry's trajectory. I think she wants to be Singer and I think she's eyeing a GOP clean sweep in '16. Dr J Curry's puzzlement at the concept of CO2 causing MORE than 100% of the warming is not unique or exceptional. The very idea that is X happens because Y then Y could cause much more X if not for another factor is beyond the binary interaction and outside their concept of causation for some people. It is 'obvious' to them that if Y causes X then there is no logical way that Y could cause MORE of X. Causative agencies are singular and not interactive. Sometimes you can get some glimmer of grok if it is framed as a weight issue. By over-eating you have gained weight. b) Warming since 1950 is predominantly caused by natural processes." what natural processes, Judith!? The sun? NO. Ocean cycles? NO. Cosmic rays? NO. i'm not saying it was aliens, but it would be unscientific not to keep an open mind about this. I poll a few friends and find that 80% of them like milk. Because of the small sample size my survey's confidence limits are +/- 30%. With a sample that small, you shouldn't approximate it with a normal distribution, but rather you should just use the binomial distribution directly. What does this have to do with climate attribution? I am not sure if Entropic man is joking or not. Relax, jammy Dodger. I am trying (perhaps too subtly) to point up Dr Curry's error. I spent a couple of years debating at Bishop Hill, and know how they tie themselves in knots when evidence and their beliefs conflict. Well. If a stranger is a friend you do not know yet, that idiot might be right. So she's arguing with herself. I've asked the question on the CE thread if Judith agrees with that. if you plug in the numbers from your paper with Nic Lewis into the change in GHGs over the period covered by the IPCC attribution statement, what proportion of temperature change is attributed to anthropogenic and what to natural? Does your analysis support or contradict the IPPC? Would you mind clarifying? Are VTG’s calculations incorrect? Is there a contradiction between your public statements and your published analysis? SILENT RUNNING CONTINUES INTO ITS 3RD DAY. you'll have guessed I'm no fan of curry's, but to be fair, I am an anonymous sniper and I don't think she's obligated to respond to me. the point at which you become convinced Judith Curry can stoop no lower, she will immediately prove you wrong"
**yes, I know. You can't believe this is possible but it really did happen. Curry has gone for the full on conspiracy theory in her latest post. "Naive scientist that I am, it didn’t occur to me until last night that the timing of the NASA/NOAA press release on warmest year was motivated by the timing of the President’s SOTU address, and that a narrative of ‘warmest year’ was needed to provide the President with a sound bite to motivate his climate agenda. " Apparently it did not occur to here that the NASA/NOAA press release was motivated by the fact that it was January 2015, the month that follows the last month of 2014 and the same month that the assessment is normally released. Curry's faux skepticism is no longer a disagreement about science . She is too busy throwing red meat to her entourage of climate cranks. What I think Curry is trying to do is slam the IPCC any way she can. In this instance, she's (ab)using the inherent ambiguity of natural language to try to show that the IPCC does a lousy job of communicating the science. This is extremely silly since for every ambiguity that she purports to find in this human-readable summary, you can find clarifications in the full report that solve all issues. For obvious reasons (at least to me, but maybe not to Curry), a short summary of a 1k pages report will not and cannot contain all the information it's trying to summarize. It's also silly because her whole argument seems to depend of her interpretation of the words in question and not on any real data of how people actually read it and what they understood by it. So those 1500+ words can be summarize (with minimum loss of information ;) ) in "I don't understand this statement so it's wrong". "So, the temperature could go down for a couple of decades and man could still be responsible for the majority of warming. Interesting." "Seems to be the case. Like I said, ‘magical’"
Luckily, someone that seems to understand the problem, painstakingly tries to explain it. I think it 'magical' how a scientists can apparently loose such a substantial part of her background knowledge. See, crap like this just makes me doubt the whole ignorance thing...seriously, somehow she doesn't think Bob's oscillator is magical? She doesn't really understand ocean heat? Judith is still pursuing her "other piece". I've just got two questions. Judith is neither confused or mistaken. She knows exactly what she's doing. Her next appointment will be a fellowship at the Heritage Foundation. "Her next appointment will be a fellowship at the Heritage Foundation." Always a possibility. But has the above statement been confirmed? Earlier this week I posted a possible explanation for Dr Curry's unscientific behaviour as "early onset". That was silly on my part because cognitive decline does not render one a liar. So why lie in the face of evidence? Who does that? Well just about everybody at The Heritage Foundation, Heartland, Cato (in the matter of climate science) and the George C. Marshall Institute. Historically these right wing 'think tanks' have been a conduit to GOP White House science appointments. I'm betting that Curry has already curried favour with Jeb Bush and is in line for a senior appointment should Clinton lose in '16. Further supporting evidence: In her latest post Curry praises Jim Inhofe's attack on President Obama's SOTU climate reference and prefers Inhofe's assessment of climate threats to that of the Pentagon, NOAA and GISS and every major scientific joint on the planet. JUDITH CURRY AGREES WITH JAMES INHOFE. Now try and convince me she is not going to replace Fred Singer. The word "magical" springs to mind when Curry proposes that a 220% cooling influence might exist - she doesn't claim (there's that word :) ) that it does, but her worldview encompasses the possibility, or at least that's the impression she gives. It may be an act, of course, since a facility for magical thinking is a requirement at right-wing think-tanks. Wouldn't the 'other piece' be the projected cooling trend absent human contributions, including volcanic aerosols and whatnot? I'm skeptical that JC's 220% tweet was more than a deliberate non sequitur, not unlike the silliness RSJTol drops on ATTP when summoned. And if I completely missed the point, mea culpa. I just can't believe that half of what Curry says is worthy of the time put into debunking it. But then, the same could be said of someone else, and I DO love your blog. You could be right about her being deliberately provocative, but it's a funny way to do it - making out she is dumb as. I don't know if she's angling for Fred Singer's job or an advisory role to the GOP deniers but it's clear she's gone way beyond ordinary denial and into nuttiness. That latest article of hers is of a standard rarely even seen at WUWT. If her strategy is to totally divorce herself from climate science and become a nutty conspiracy theorist writing nonsense, then she's already there. She doesn't need to change a thing from here on in.